There is something for everyone at every level. Come learn to be awesome with us! Come hang with us! In this class you can learn the moves and transitions to bend and twist your body gracefully around this circle in the sky. 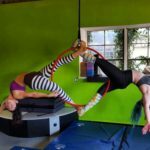 In beginners Aerial Hoop class we will focus on the basics of aerial bar work. You will learn how to steer the lyra, body positioning, balance, and conditioning moves that will allow you to properly execute moves with grace and style (neither of which you need to join in). Level 1 class focuses on movements and poses beneath the bar and inside the hoop. This is a 60 minute class. Instructed by Sihka. Drop Ins Allowed. $25/class. When you sign up and prepay for the whole 6 week course the price per class is discounted to $20/class. Register online today though The Last Carnival calendar page. Intermediate to advanced students that are comfortable in the air and can hold themselves into poses for longer periods of time and have the stamina to transition safely through multiple moves are ready to move to level 2 with instructor permission. In lyra level 2 we will be cleaning up poses from level 1 class as well as start learning moves above and outside the aerial hoop. This is a 75 minute class. Instructed by Sihka. Drop Ins Allowed. $30/class. When you sign up and prepay for the whole 6 week course the price per class is discounted to $25/class. Register online today though The Last Carnival calendar page. In lyra level 3 students will focus on momentum moves, more muscle moves, drops, and dynamic movements and transitions. We will be playing with the artistry of the apparatuses and creating sequenced moves to music. In this class students will also learn how to break down movements they think up or see and understand what makes moves safe or not and how to work through movement with understanding. 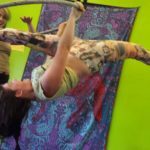 What is Aerial Hoop a.k.a Lyra? 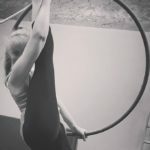 The aerial hoop (also known as the lyra when it has a flat top, aerial ring or circeaux) is a circular metal apparatus (resembling a hula hoop) suspended in the air. Circus artists use it to perform aerial acrobatics. 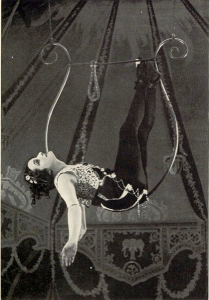 The act usually combines static and swinging trapeze skills with static, spinning, and swinging poses. Aerial hoop is similar to some styles of gymnastics. However, it is performed as an art form instead of a competitive sport. 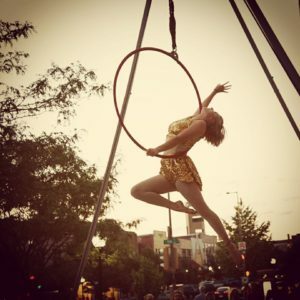 Aerial hooping involves a great deal of strength, flexibility, and grace. As such, it is also a popular fitness activity. The poses and movements tone the whole body while improving flexibility and balance. Aerial hooping is a beautiful art form. It is of the oldest and most respected forms in the aerial tradition. Aerial hoops help performers create stunning displays of skill high above the stage.